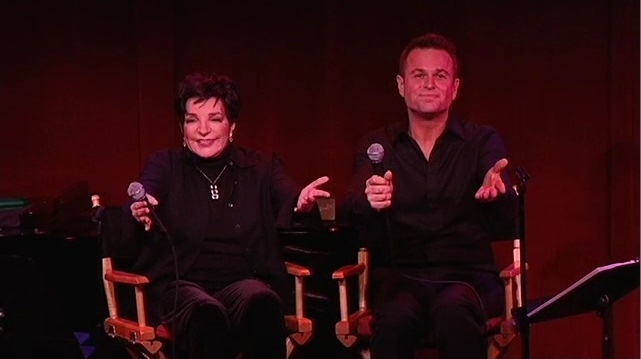 Liza Minnelli and Sam Harris. Billy Stritch helming piano off left. Image from video of November 20 opening number by Broadwayworld.com. Social networking got me to Liza and Sam at Birdland this past Sunday. I jumped into social networking about five years ago while living in Chicago and was immediately rewarded for my efforts with entertaining interactions with my local and national and increasingly international theatre friends and colleagues. Not only are these folks verbal and funny and entertaining, I soon discover, but the theatre world was moving toward doing most of its swiftly moving public relations via Facebook and Twitter and other platforms that I try to ignore so I can get at least a modicum of work done. Yet the theatre-related benefits are real in this hyper-connected cyber world: up-to-the-minute reviews, newest tickets available, where people are going or where they’re cast or … all of it Immediately. And these cyber connections helped me keep my sanity through frequent travel then several moves in quick succession (Chicago to Philadelphia to New York city) between 2009 and 2011. The latest dramatic example of my own personal piece of the cyber-ly interconnected world is the way in which I got myself to the November 20, 2011 Liza Minnelli and Sam Harris concert Schmoolie & Minnooli at the gloriously old-fashioned, intimate and comfortable Birdland cabaret and jazz joint on West 44th Street in my new hometown. A young fan from a discussion board, who I have known for about five years and who lives in Ireland, sends me a note on Facebook on October 31st reporting he had read on Sam Harris’s page of a newly announced concert at Birdland. With Liza. Within minutes I make a transaction. (And I don’t believe there were any tickets available for either of the nights of this engagement within hours, maybe minutes, of this initial announcement.) After the rush to obtain the key to entry, after many theatrical adventures and trips in the intervening weeks, the performance I am privileged to observe with Liza, her good friend Sam Harris, and supported by the stalwart Billy Stritch at the keyboard is calm, quiet, intimate, special, transformational. More of this kind of performance Ms. Minnelli. As with your newest recording Confessions, this intimate and storytelling singing style suits your 65-year-old style and performance wisdom. We are welcomed like family — hard not to feel like that when you’re cheek by jowl by neighboring tables, no seat in the house more than four tables from the stage (apart from a set of tables to far audience left). Companion Juliana and I are center and back a few tables, basking in the feeling that we’re in Ms. Minnelli’s living room during one of her parties, enjoying performances after dinner. But we can give standing ovations and we do, several times in the course of the evening. The pure pleasure and often unadulterated sobbing delight is in watching these two master performers watch each other in performance with calm, with focus, with fandom, with love. It is enchanting. I only regret that from my position in the audience I didn’t have a great view of Billy’s face too — but honestly that might have been too much. “Two of a Kind” (Sam and Liza). This constitutes a call back lyric and musical sequence throughout the evening. “I Can’t Make You Love Me” (Sam) with modestly intentionally reverbing mic, solo, and stirring. Banter about their injuries, quite a funny bit. Sam goes first in response to her naming the body parts — including his own artificial hip after The Life. For her he prompts and she responded. Hip — The Act. Other hip — The Rink. Foot (referring to her current injury): “I tripped on a damn dog.” … resolving the musings on the show biz life as “the glitter, the glamour, the gutter” and a newly lyric-ed “Razzle Dazzle” and a favorite side comment: “When you’re in pain, just modulate the key”. “On Such a Night Like This” (Liza). Accompanied by Billy here as she is on her recording Confessions, prepended by the story of this song as part of a show she was almost in as a teenage with Jeanette MacDonald (I love this detail for oh so many reasons) sets the story of the tune as an experienced older performer showing a younger performer around a movie studio .. the feeling of the romance of movie making is palpable, and the family connection aching and beautiful. “It was such a night like this / when Judy Garland swore / I just adore him how can I ignore the boy next door.” Goodness. Tunes from an upcoming show featuring Sam about the life of Al Jolson. A new framing tune leads him and us into Jolson tunes including the final “Swanee” — which is fine except for his choice this evening to deliver it with the orchestration that Judy Garland used for that tune from A Star Is Born (1954) through the end of her life in performance on the concert stage. “What Did I Have That I Don’t Have” (Liza). With an intriguingly misleading intro vamp that sounds precisely as if we were going into “Maybe This time” .. but no, deliciously no. Instead we go into a fabulous tune at the core of the fabulous score of On A Clear Day You Can See Forever currently in revival on Broadway (with of course movie version ties to her father director Vincente Minnelli). The informal, they’re-just-getting-the-set-list-together nature of this engagement actually enhances for me the experience of this tune. Several lyric sequences and deliveries challenge Liza a bit, and she cuts herself off several times, with laughter. The third time is the charm and she delivers a walloping finale. It is a pleasure. It is a privilege. It is precisely the kind of evening my childhood self dreams might be possible in the city of my wild aspirations. Capped off by a few words with Billy Stritch, who I am meeting in the flesh for the first time but who has been a Facebook “friend” for some time. Which only means he was familiar enough with me to know me as the woman with the odd name. I’ll take that. Happily.